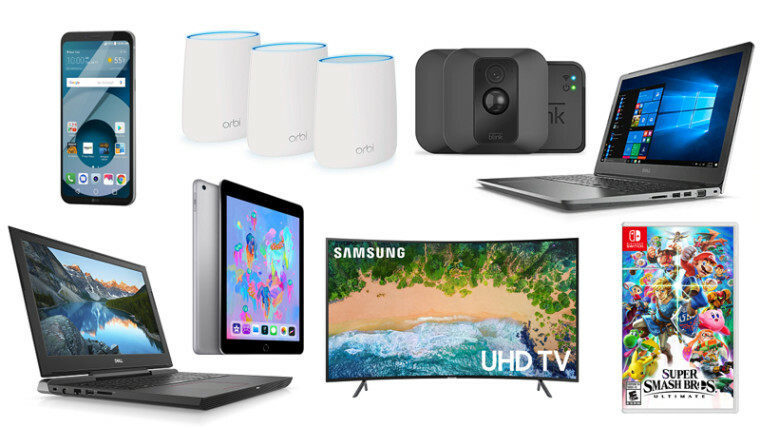 We have some great laptop deals today (Dell Vostro 15 5000 for $449, Dell G5 for $849, Acer Predator Helios 300 back for $999), along with the Netgear Orbi 3-Pack for just $210, courtesy of TechBargains. Dell Vostro 15 5000 Intel Core i5-7200U 15.6" 1080p Laptop for $449 at Dell (use code: VOSTRO449 - list price $1027.14). This is $20 off the discounted price we saw earlier this week and $270 off the normal $719 sale price. Dell G5 Intel Core i5-8300H Quad-core 15.6" 1080p Laptop with 6GB GTX 1060, 16GB RAM, Dual Storage for $849 at Walmart (list price $1099). This is a great price for gaming laptop equipped with a GTX 1060 6GB graphics card, 16GB RAM, and 256GB SSD + 1TB HDD. We normally see a gaming laptop with these specs for closer to $1000. Netgear Orbi RBK23 AC2200 Whole Home Mesh WiFi System (3-Pack) for $209.99 at Amazon (Clip $40 Coupon - list price $299.99). With the $40 clip coupon, this is one of the lowest prices we've seen outside of Black Friday. Upgrade your home's WiFi to get over 6000 square feet of coverage and speeds up to 2.2 Gbps. Acer Predator Helios 300 Intel Core i7-8750H 6-core 15.6" 1080p Gaming Laptop with 6GB GTX 1060, 256GB SSD, 16GB RAM for $999 at Amazon (list price $1299.99). 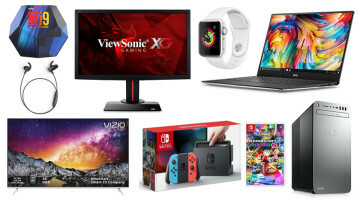 This deal is back, saving you $300 off the list price on this gaming laptop equipped with a GTX 1060 6GB graphics card, 16GB RAM, and 256GB SSD. Lenovo Chromebook S330 MediaTek Quad-Core 14" 1080p Laptop (4GB/64GB) for $219.99 at Amazon (list price $279.99). Save 21% off on this Lenovo Chromebook with 64GB eMMC flash memory. 65" Samsung UN65NU7300 4K UHD Smart LED HDTV for $699.99 at Walmart (list price $1399.99). Save $700 off list price on this 65" 4K TV (price seen in cart), with free freight shipping included. 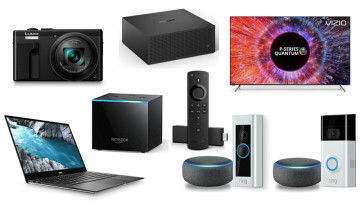 Blink XT Home Security 2-Camera System Bundle for $139.99 at Amazon (list price $229.99). Get this weatherproof 2 camera bundle kit for just $140. Features 1080p resolution, motion detection, and instant alerts. 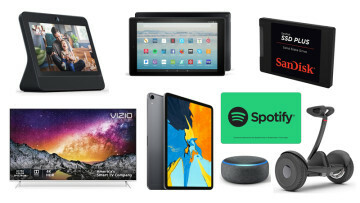 Apple iPad 128GB 9.7" Retina WiFi Tablet (2018 Model) for $329 at Walmart (list price $429.99). Walmart continues to feature this 128GB iPad for $100 off. LG Q6 32GB 5.5" 2160x1080 GSM Unlocked Smartphone for $139 at Walmart (list price $299). Features a 5.5" 2160x1080 IPS FullVision display, Qualcomm Snapdragon 435 1.4GHz octa-core processor, 32GB storage, 13MP camera and 5MP wide angle front camera. Super Smash Bros. Ultimate (Switch) for $49.89 at Walmart (list price $59.99). This is the first major discount we've seen for Super Smash Bros for Switch from major retailers. A great party game and an instant Switch classic. 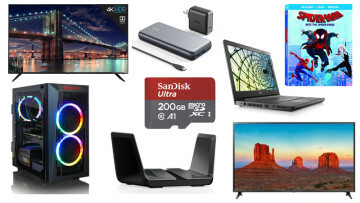 These are just a small example of the deals on offer today, for more great deals go to TechBargains.